Last week saw the return of our Mathletics tournament in school. From Monday morning until Friday lunchtime the children were competing with each other at home and at school to earn the most point on the Mathletics leader board. This competition saw some children take it to a whole new level. 6 girls in Year 3/4 acheived over 10,000 points over the week. A special mention must go to Freya Horn in Year 3 who clocked up over 40,000 points and ended up second on the world leaderboard!! This is a phenomenal achievement and shows a fantastic attitude. Both the Year 3 class and the Year 4 class ended up on the class leaderboard, the children in both of these classes should be very proud of their achievement. Year 5/6 - Jessica Hunt. I also must mention that this means that since the competition began last year Jessica Hunt remains undefeated in Year 5/6. She has taken home the trophy everytime! Well done Jessica! 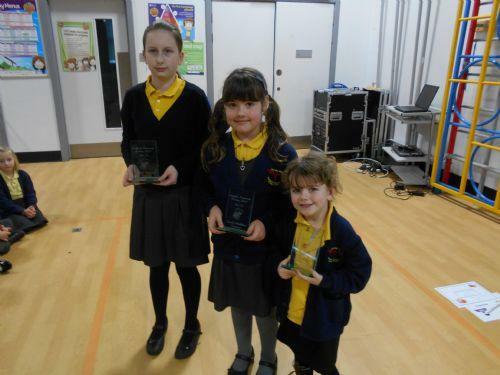 Here are the competition winners with their trophies. Well done girls!